Add predictive content to an email. With every click, download, view, and purchase, subscribers provide clues about their preferences. Predictive intelligence analyzes past behavior and predicts their future. It’s the closest thing marketers have to a crystal ball. Observe website behavior for at least 30 days before you launch predictive content logic. This 30-day monitoring period allows the engine to dynamically build profiles and behavioral intent patterns of your user base. NTO’s final requirement is to include three recommended product images in the email. To meet this requirement, Leung decides to combine the predictive intelligence of Marketing Cloud’s Personalization Builder with the flexibility of Content Builder. First, let’s get to know Personalization Builder. Personalization Builder is a Marketing Cloud app that applies sophisticated algorithms to user-behavior data to build subscriber preferences profiles. The profiles indicate intent, they hint at what the subscriber will do next. Marketing Cloud uses these hints to predict and deliver the right message and content for each subscriber. Without predictive intelligence, every subscriber would receive an email that recommends NTO’s top-selling products. With predictive intelligence, each subscriber receives personalized recommendations based on user behavior such as previously viewed products. There are a few ways to create recommendations in Content Builder. One way is to use an Einstein Content Block. Another way is to use Personalization Builder to create the recommendation and related HTML code, then cut and paste the code into an HTML block. Leung chooses the latter. 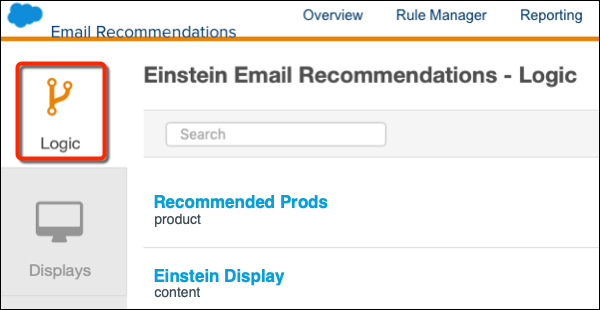 In her email design sketch, Leung specified that she'd use an Einstein Content block for the recommendations. Since she’s creating the recommendations in Personalization Builder, she’s using an HTML block instead. That’s a little bit of a curve ball. Not to worry, though. Later in this unit, Leung shows us exactly what to do. But, first things first. She maps out the high-level steps for basing recommendations on subscriber purchase history. 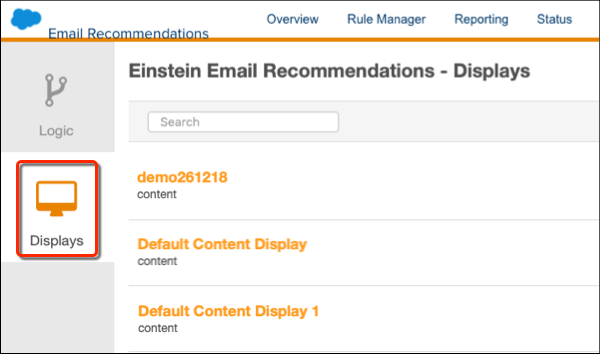 Display: Create a Display that identifies the content elements, such as product name and image, to show in the email recommendation. Logic: To create custom recommendation logic, specify what, when, and how. 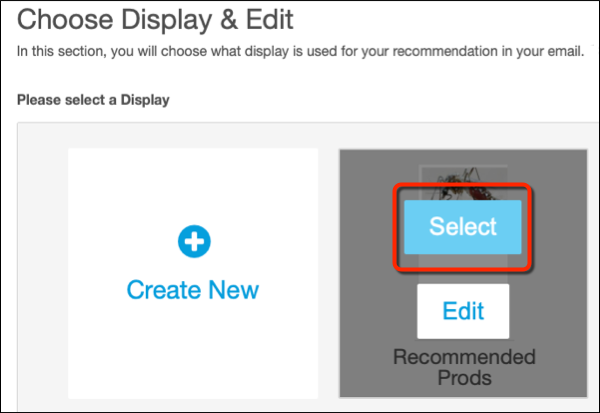 What to show in a recommendation: Choose an existing Display or create one. When to show specific recommendations: Add recommendation scenarios. How and How Many recommendations to show: Set the number of rows and columns in the layout. Code: Copy and paste the generated code into the NTO email. With the steps mapped, Leung is ready to create the recommendations. She opens the Personalization Builder navigation dropdown list and selects Email Recommendations. First, Leung created the Display for the product recommendation. 1. Click Displays in the left navigation window. 2. Click Create a New Display. 3. Enter Recommended Prods when prompted to create a unique name for the display. The Create a New Display form loads. This is where Leung constructs and formats what to show in the email for a product recommendation. Her options are practically endless. She can include a product image or not. She can display the product price in green text and the discount price in red text. She can replicate NTO’s catalog display. Bottom line: she has a blank canvas to create a look and feel her customer will love. For this project, each recommendation must include a product image and a description. Select ImageLink in the Add an Identifier field and click Add. Select Description in the Add an Identifier field and click Add. Click Preview to confirm the layout matches the requirements. Next, she creates the custom recommendation logic. To do this, she chooses a display, adds recommendation scenarios, and sets rows and columns. 1. Click Logic to see a list of existing email recommendations. 2. Click Create New Logic. 3. 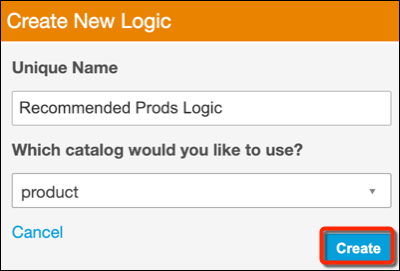 Enter Recommended Prods Logic in the Unique Name field. 4. Select the product catalog. 6. When the Choose Display & Edit form loads, hover over the Recommended Prods display and click Select. Next, she’ll choose when the specific content is shown. To do this, she creates a business rule that must be met for a specific recommendation to appear in the email. For example, when a subscriber buys shoes, the email contains a recommendation for socks. 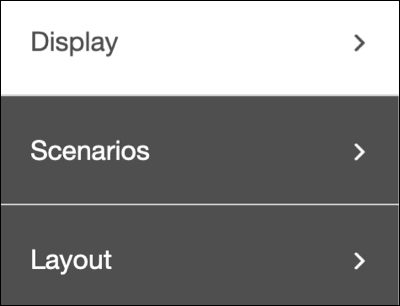 Leung clicks Scenarios on the left navigation menu. The nav section expands to show a dropdown box that contains a list of built-in recommendation scenarios. Leung selects Bought Bought and clicks Add. Bought Bought translates to “people who bought this item also bought these items.” For details about what each scenario does, read the Einstein Recommendation Scenarios help doc. The next step is setting the row-column layout for the recommended product content. 1. Click Layout on the left navigation menu. 2. The Rows & Columns canvas appears. 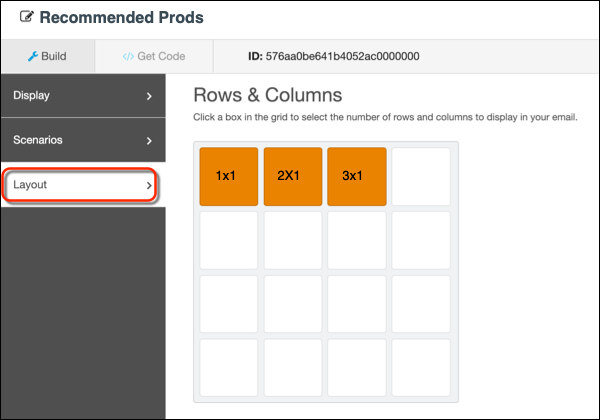 To set the layout to one row with three recommendations, click the 3x1 box. 3. For a sneak peek of how the recommendations look in the email, click Preview. 4. Exit preview and click Save. Leung loves what she sees. The recommendation is fully configured and ready to be added to the email. Adding the recommendation to an email is as simple as copy-and-paste. 1. Click Get Code and the generated recommendation code appears. 2. Copy the HTML code, exit Personalization Builder, and launch Content Builder. 3. Open the NTO promotional email in edit content mode. 4. Drag the HTML content block onto the email canvas (1). 5. Paste the HTML code (2) into the block. 6. Click Done Editing (3). 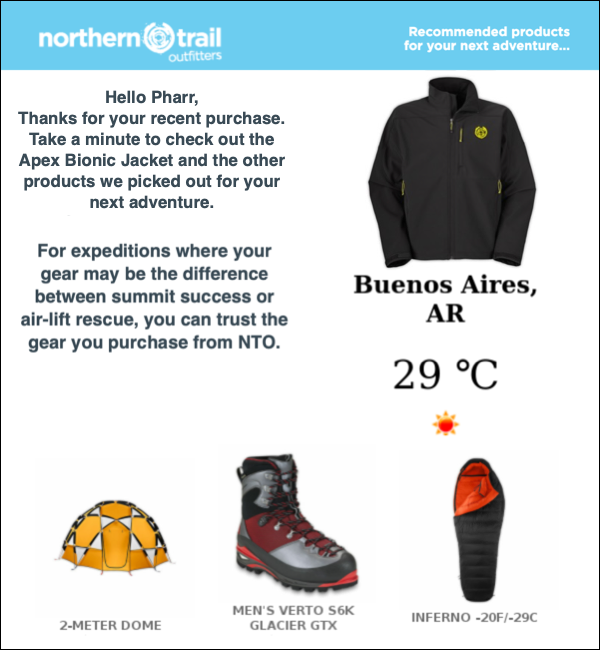 When a subscriber opens the email, they see three personalized product recommendations that take into account their NTO purchase history. The recommendations even factor in purchases made after the email was sent. When a subscriber receives the email, makes a purchase, and then opens the email—in that order, the recommendations reflect the new purchase. Goodbye, static emails. Hello, dynamic smart content! Requirements met, Leung takes a look at the finished email. The email is sure to engage NTO subscribers with its personalized, relevant content. Leung has a new appreciation for Content Builder’s breadth of options. She plugged-and-played content to her heart’s content, implemented a highly personalized engaging email, and helped NTO reach its goals. Now it’s your turn.